As ATF requirements lean toward lighter viscosity, this one has ultimate stability. 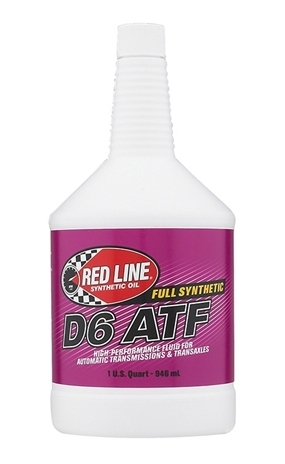 Red Line full-synthetic D6 ATF is a lower viscosity version of the D4ATF and is designed for better fuel efficiency in CAFE testing. Dexron VI requires a different approach to a conventional ATF formulation. Rather than beginning with a 7.5 cSt fluid and allowing a viscosity loss in use to drop to 5.5 cSt, the Dexron VI fluid requires a starting viscosity of less than 6.4 and a final drop to no less than 5.5 cSt. Red Line D6 will drop to no less than 6.1 cSt. Since the final viscosity after use of these fluids are similar, Dexron VI fluids can be used where Dexron III fluids were previously recommended (except for some manual transmission applications, our customers report). D6 ATF also provides significantly improved gear protection and will provide a GL-4 level of gear protection. The balanced frictional characteristics provide smooth and consistent shifts for extended drain intervals. The superior stability compared to petroleum ATFs allows high-temperature operation without varnishing valves and clutches which leads to transmission failure.